In 2001, we built a 2000 square foot screened, open air aviary building to house our Caiques and Brotogeris Parakeets. Our design gives the birds fresh air and natural light while protecting them from bad weather, predators, insects and other pests. The overhead misting system allows the birds to enjoy a rainforest atmosphere and provides cooling during the hot summer months. 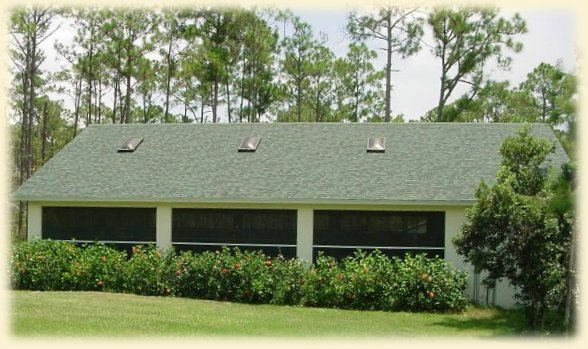 The building has hurricane shutters as well as a specially built hurricane room. We have custom-designed monitoring and security systems, and full-power backup for all equipment as well as for our buildings. Copyright © 2008 Shady Pines Aviary - No part of this page may be reproduced without the express permission of the author.